This driver swings fast! Between the longer shaft and faster swing speed the stock driver is already one of the best distance drivers made. I got to swing one on a launch monitor at Golfsmith before purchasing the shaved one and was getting an extra 5 or so yards over my Ping G30. I decided to purchase this one from Worlds Hottest and am getting a good 25 yards more distance now. Has a nice sound and feel to it and I don’t feel like I lost any accuracy with the slightly longer shaft. How can you go wrong, not only are you getting new technology in the driver, but your also getting the most distance possible! 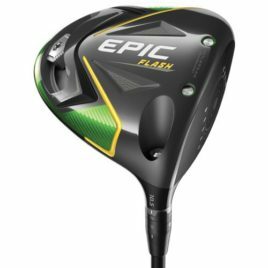 I have gained easily 25 yards with each swing of my Cally Epic Flash Driver….And it only gets better each time I tee it up on a new course!! Don’t have anything negative to say. The driver has a nice low spin rate and good launch angle. Ball speed went from 127 to 133 after being shaved. Not too shabby! I wish they had a way to repaint the face black after shaving but no ones has noticed that it’s not supposed to be silver. When they said they already had thinner face and distance was maxed in their Long Drive heads, think again! I had increased my overall driving distance by 28 yards!!! I kid you not!! Already have one coming in a longer shaft so I have my playing setup in the bag for my accuracy holes and my longer shaft for the extra long Par 5 holes! And if I can continue my accuracy as well as I have been, its going to be lights out all day! as for the face not having the same finish, its ok, gives me acutally better alignment so I know where the face is aiming at.